June is National Audiobook Month, which is great – I love audiobooks. 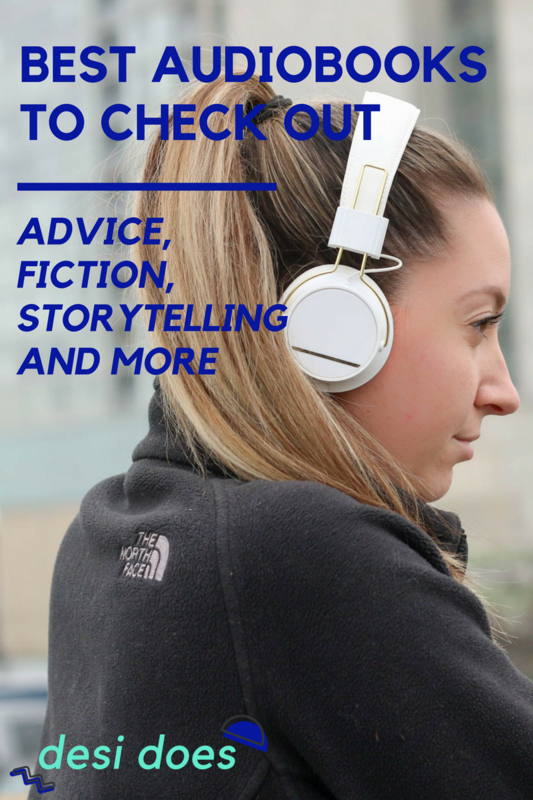 Podcasts can be a fun way to pass time at work or on a commute, but audiobooks are just as great and educational. A few years ago when I was driving from Nashville back to my hometown in Michigan, I popped on Maybe in Another Life by Taylor Jenkins Reid on Scribd, and it started two love affairs: one with audiobooks, the other with TJR. They can also be meditative – when I’m doing really repetitive tasks, or cleaning the house, it can be nice to have a narrative rather than back-and-forth gossip of a podcast or music. To celebrate this month, I’m sharing some of my favorite audiobooks! Astrophysics for People in a Hurry by Neil deGrasse Tyson: What is the nature of space and time? How do we fit within the universe? How does the universe fit within us? Neil deGrasse Tyson wrote (and narrates!) this book with quick answers to broad, big topics. It’s clever, it’s easy to understand, and it’s easy to turn on and off – he presents a lot of the information in easily digestible bites to fit into any schedule. I really liked this a lot, and it made me think a lot about the world and the universe. Yes Please by Amy Poehler: Another memoir by a female comedian, this audiobook is awesome. Amy invites Seth Meyers to read a chapter, as well as Carol Burnett, and both are exceedingly funny. Plus, my friendo Craig Finn gets a shoutout – they went to college together in Boston. Small world. She dispenses a lot of advice about what it’s like to be a powerful woman, especially in male-dominated fields, and how she overcame the stigma of being too assertive. Good Clean Fun by Nick Offerman: Seeing a pattern of specific non-fiction books I like? This was a random pick for work one day – I don’t have a particular interest in woodworking or construction, outside four years of high school theatre – it just seemed like a good workday listen. His voice is almost meditative – very calm, soothing, and would be a really great bedtime story, or even to pop on to calm anxiety. The Radium Girls by Kate Moore: I learned about “the radium girls” a few years ago from a Buzzfeed long read. In the 1910’s, many women in New Jersey took great jobs painting on watch faces – without any knowledge that they were being poisoned by radium, not knowing what consequences they would all eventually face. This book chronicles their story as well as the worker’s rights and labor laws their experience changed. Wondering how I read so much? My libraries use Libby and Hoopla– see if your library has a partnership, and check out the mobile app! When listening to fiction, I look for books with multiple actors – it really helps me picture the action, and helps keep things straight! Plus, it’s more like listening to a fiction podcast, which is something I’m exploring more and more lately. Welcome to Night Vale by Joseph Fink & Jeffery Cranor: I’ve wanted to get into the Welcome to Night Vale podcast for quite awhile, but was never sure where to start – when I saw their first book on Libby, it seemed like a great way to jump in. It’s a really unique story, and I loved the way it built and resolved. The narrator is excellent – he also hosts the podcast – and it’s plenty long, if that’s something you’re looking for! Lincoln in the Bardo by George Saunders: To be fair, I haven’t actually finished this one yet. But I absolutely love the large and varied cast of voice actors, including Nick Offerman, Carrie Brownstein, Ben Stiller, Rainn Wilson, Kat Dennings, and even more – it makes it feel almost like an old-time radio show, with each character having their own voice. This was also the 2017 Audie winner, and it’s easy to understand why! Historical fiction is a very difficult genre for me to get into, and the way this audiobook is done, even I am enjoying it. One of Us is Lying by Karen M. McManus: This is a bit of a long listen, which could be a good thing if you really want to get invested in the characters. The story of a high school murder mystery, someone dies during after-school detention, and the search to reveal who was really behind the death. This book also features multiple voice actors, so it’s easy to keep the characters straight – important for listeners who might otherwise get confused by dialog in fiction audiobooks. Eleanor Oliphant is Completely Fine by Gail Honeyman: Admittedly, this book hasn’t come through my library holds yet, but I can’t wait to listen. Another nominee for the 2017 Audie Awards, the preview sounds great, and the book has widely gotten great reviews. Queue this one up on your phone for poolside listening and skip squinting at a book or eReader! Maybe in Another Life by Taylor Jenkins Reid: I can’t finish the list off without a nod to what made this such a compelling listen for me. Voiced by actress Julia Whelan, the story is wonderful, but Whelan’s performance adds a lot to the story. It’s told in a dual timeline, from the point of view of Hannah Martin. Whelan changes her voice for each timeline to accurately reflect the person Hannah is, and what she’s going through, in each. If this book doesn’t sound up your alley, keep your eye out for anything narrated by her – she’s really wonderful and narrates the best audiobooks! What do you think are the best audiobooks? What ones are your favorites? I’m always looking for new things to listen to during work or on the road!